Avocado egg rolls are packed full of sweet and spicy flavor, with creamy avocados and juicy mangoes all wrapped up in a crunchy, golden shell. By now you all know that I love entertaining. And my husband is always looking for an excuse to get a tailgate party together. So I am already starting to dream up my perfect menu for the Big Game! I adore avocados, and finger foods are essential for any tailgate party, so an avocado egg roll was the first idea that came to mind. 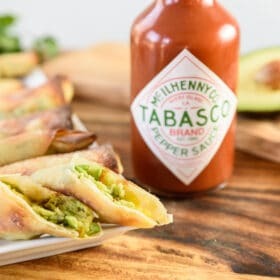 When Avocados from Mexico asked me to create a recipe using both Avocados from Mexico and TABASCO® Sauce, I was all in! Avocados are so versatile. I swear I can eat guacamole on absolutely anything! Seriously, I even eat guacamole for breakfast sometimes. It’s amazing with toast and poached eggs. And come to think of it, I bet that would taste even better topped with a bit of TABASCO® Sauce. 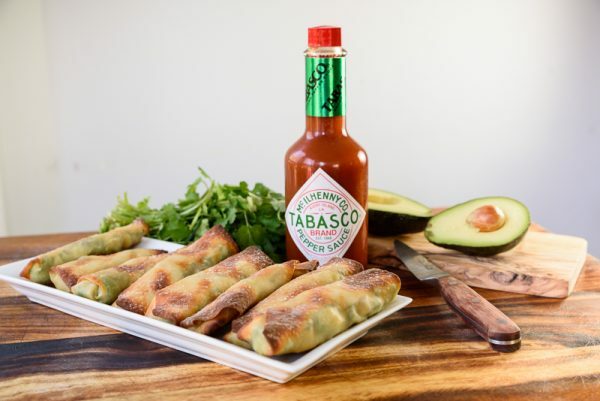 If you like these Avocado Egg Rolls, be sure to check out the Avocados from Mexico Pinterest board for more incredibly creative recipes. I know I will make a ton of these! Let’s Make Sweet & Spicy Avocado Egg Rolls! This recipe really couldn’t get much easier. There are only five ingredients – and it takes less than five minutes to prep the avocado egg rolls and get them into the oven. Start off by chopping the ingredients for the egg roll filling. Peel and remove the pit from two Avocados from Mexico, and roughly chop into ½” cubes. Then, peel one fresh mango. Save half of the mango for another recipe (or just eat it! 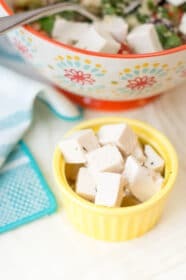 ), and dice the other half for your egg rolls. Roughly chop some fresh cilantro. This is another ingredient that I use in all kinds of recipes. It’s a great herb to keep in your kitchen garden. Isn’t this beautiful? It’s going to taste amazing! Next, it’s time to make the avocado egg rolls! Lay out eight egg roll wrappers on a cutting board. Most grocery stores carry egg roll wrappers these days. If you have trouble finding them, look in the produce section or near the natural/organic foods. Spread a layer of chopped avocado diagonally across each egg roll wrapper. Top that with a layer of diced mango and a sprinkle of fresh cilantro. 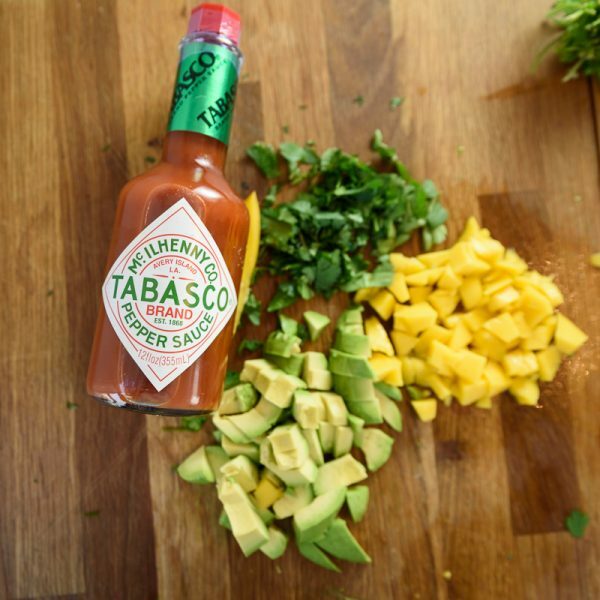 Now, we add some serious flavor with TABASCO® Sauce! 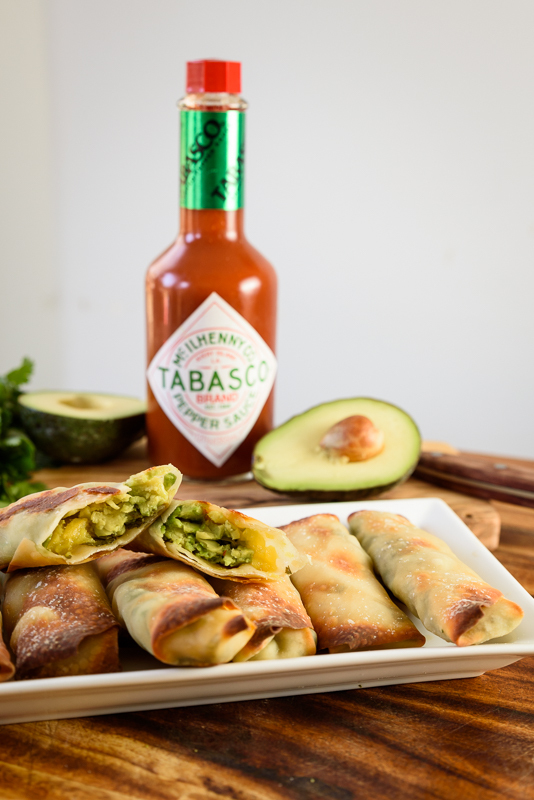 Just drizzle the TABASCO® Sauce on top of the avocado-mango filling, and then roll up your egg rolls! 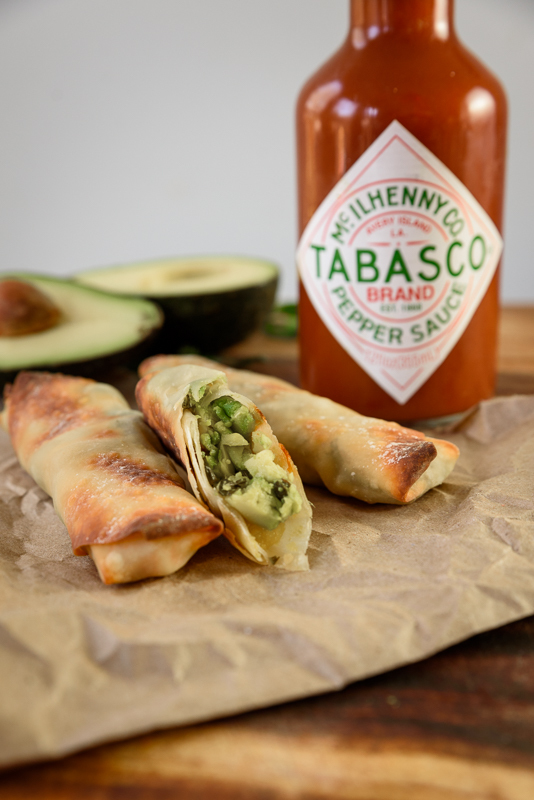 The TABASCO® Sauce gives these avocado egg rolls an incredibly unique flavor. The sauce is made from three simple ingredients – tabasco peppers, high-quality vinegar, and just a bit of salt. And the ingredients are marinated for three years in wooden barrels before bottling. Isn’t that incredible? Maybe that’s how they pack so much delicious flavor into TABASCO® Sauce! Once your egg rolls are securely wrapped up, you’re ready to bake them. Of course, egg rolls are traditionally fried in hot oil. But I prefer to leave the deep fryer securely packed away and go with a lighter, baked version. Heat the oven to 375 degrees, and bake the egg rolls for about 12 minutes, until they are lightly browned. 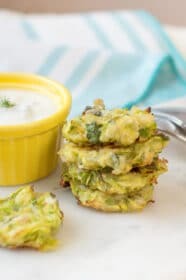 You can eat them just like this, or you can serve with your favorite dipping sauce! 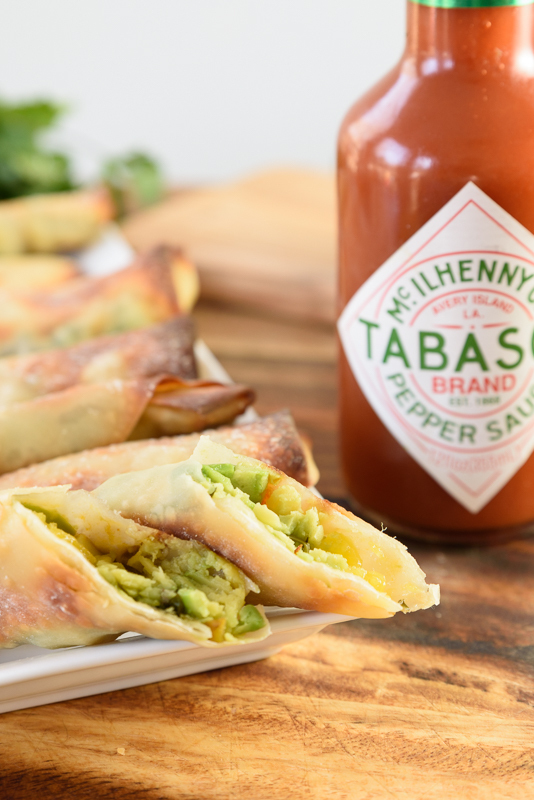 These would be great with a spicy mayo sauce– which you could make by simply mixing together some plain mayo with a dash of TABASCO® Sauce! For a limited time, you can enter for a chance to win $1,000 simply by following and sharing recipes from Avocados from Mexico and TABASCO® Sauce! Login below to see the terms and conditions, and enter the giveaway! Avocado egg rolls are packed full of sweet and spicy flavor, with creamy avocados and juicy mangos all wrapped up in a delicious, crunchy shell. Roughly chop the two avocados, into approximately 1/2" cubes. Dice the mango into small pieces. Lay the egg roll wrappers flat on a cutting board. Spread a layer of avocado diagonally across each egg roll wrapper. Top the avocado with a layer of diced mango. 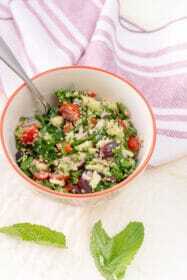 Sprinkle with cilantro, and drizzle with TABASCO(R) Sauce. Fold the egg roll wrapper around the filling, forming a closed tube around the avocado-mango mixture. Arrange the egg rolls on the oiled baking sheet, and spray the egg rolls lightly with olive oil. Bake for 12 minutes, or until they egg rolls are a light golden color. 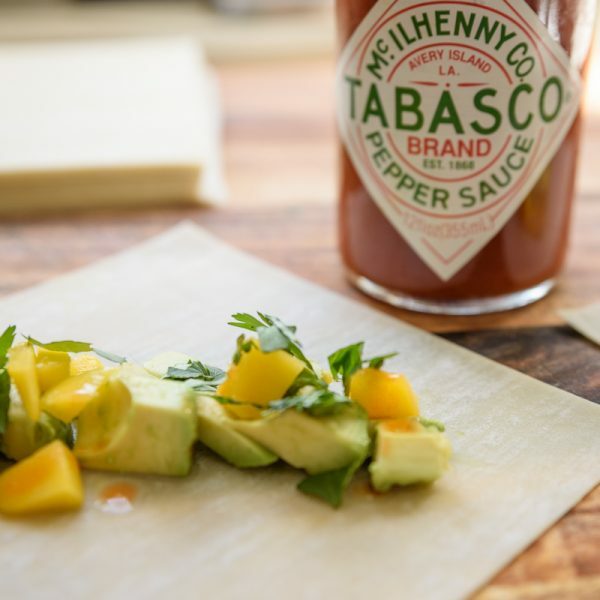 More Avocados from Mexico and TABASCO® Sauce Recipes! 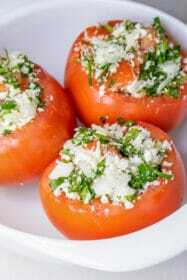 Did I mention that this recipe is part of a contest? I just love a little friendly competition. 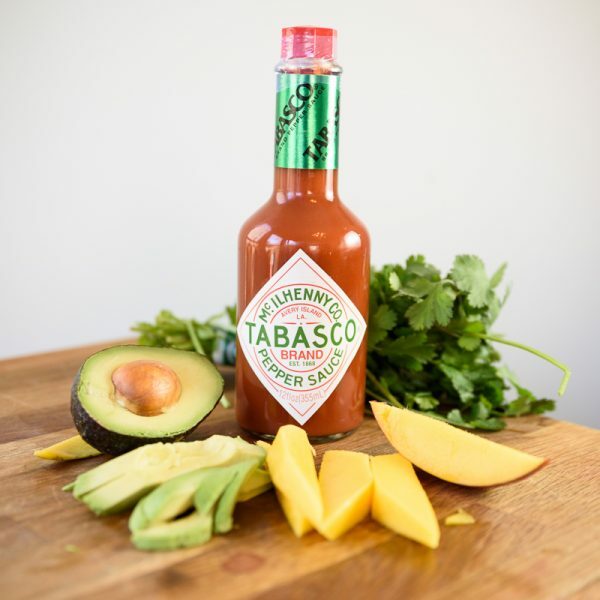 I’m working on a team with four other bloggers, to see if we can craft the very best Big Game recipes for Avocados from Mexico and TABASCO® Sauce! So show your love by checking out my teammates’ recipes– they have some fantastic creations. I am totally in love with these Crispy Baked Avocado Fries from Bell’alimento! For the non-vegetarians in the crowd, there are Chorizo Potato Tacos from The Wicked Noodle and Slow Cooker Beef Tacos from Kleinworth & Co. You could totally vegetarian-ize these two by using tempeh or soy crumbles instead of chorizo or beef. And last but not least, there are Spicy Chicken Salad Avocado Bowls from Tamara Camera Blog. This last one could be made veg-friendly by substituting soy “chicken”. Or stuff the avocado bowls with spicy egg salad instead! I love that you baked those! Am pinning it to give a try. Love it so much, I will try to make one. I love sweet and spicy dishes. Thanks for sharing! Love this! Just entered the giveaway. I’m not big on avocados, but everyone around me is! I love all the things about this and adding this to my must try list! MMMM!!!! 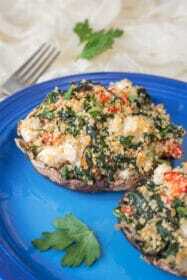 It looks quite healthy and tasty!!!! I’ll definitely try to make this, Thanks!! 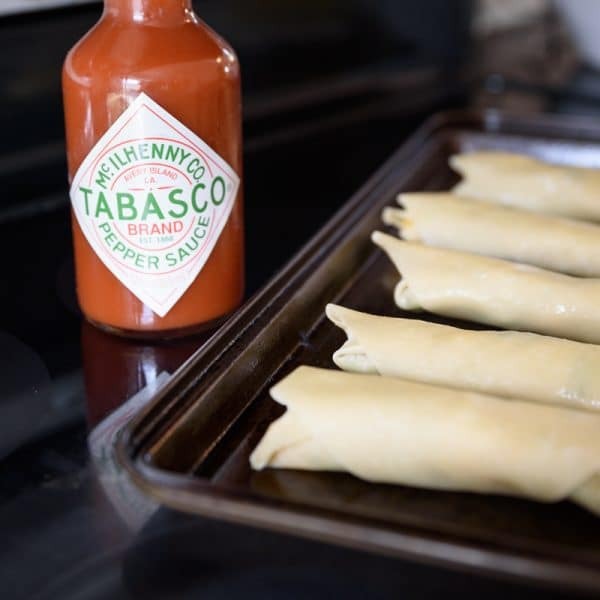 I’m not a fan of hot sauce, but these would be perfect for a tailgate party for sure! They would definitely be a hit with my family, too. & great giveaway!! Nicole, this looks yummy. But I have to know what drink to have with this now – suggestions? I would definitely go with margaritas! This looks amazing!!! My kind of meal! Sweet and spicy is my jam. 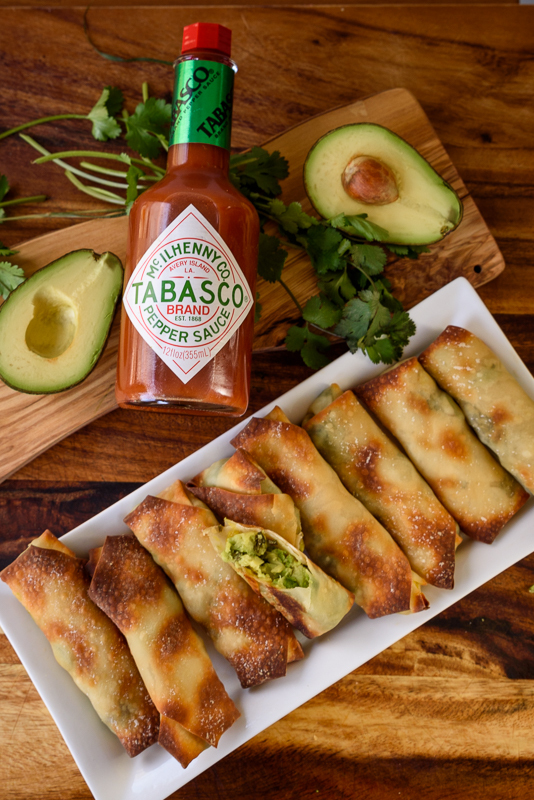 Loving these egg rolls packed with avocados. Thanks Paula- I hope you give them a try!